Calon Lan Centre at Mynyddbach Chapel is host to multiple events throughout the annual calendar. We admit that we have let many slip by in the past. However, our renewed intention is to let you know about the activity that we host on a regular basis. Hopefully, as news of each event success filters through, you will find inspiration to come and join us for future events! We love to host choirs, whose voices fill the acoustically excellent chapel during evening recitals. We are also a great venue for TV and radio production recordings due to our quiet off-road location. Mynyddbach Chapel itself hosts multiple meetings on the Christian calendar (be sure to look out for news of upcoming gatherings). We love hosting local school events, and are constantly in touch with schools in the area with regards to school productions and special Daniel James projects. 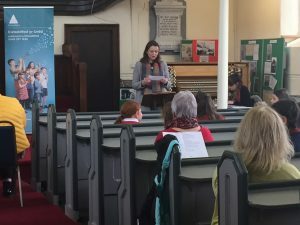 Our most exciting news is of our preparations for the first annual Calon Lan Festival in 2020. We can’t reveal too much yet, but watch this space for exciting announcements in the coming weeks! And as news of our venue reaches more event organisers, we are looking forward to many a great event to come.